Leigh Electrical offer a comprehensive Appliance Testing Solution for Southend & Essex Landlords. Our highly qualified engineers can ensure your full legal compliance with Appliance Testing regulations 7 days a week. This ensures a maximum level of convenience for yourself and your tenants. Our punctuality and professionalism have been mentioned numerous times in the hundreds of 5 Star reviews we have garnered on the various tradesman comparison sites. Our prices are extremely competitive for PAT work and as with all of our services, it is covered by our 5 Year NICEIC backed guarantee. Call Leigh Electrical today on 01702 873350 to arrange a quote for your Appliance Testing Requirements. Leigh Electrical hold full NICEIC registration, which gives our customers who are landlords complete peace of mind that all of their testing requirements are going to be conducted to the highest standard of electrical service in the UK. Our NICEIC membership guarantees all the work we conduct for our landlord customers for a full 5 years following completion. To find out more information about NICEIC membership, what it means for you as a landlord and about the Platinum Promise, please follow the appropriate links. Alongside our NICEIC registration, Leigh Electrical hold full TrustMark certification, this is the Government scheme to help landlords and the general public use the services of trustworthy and reputable trades people. Leigh Electrical also offer a wide range of other electrical services that can be useful to landlords, homeowners and businesses alike. Using our services means that all of your electrical requirements can be covered by one company, who are always on standby to assist, whatever the problem. 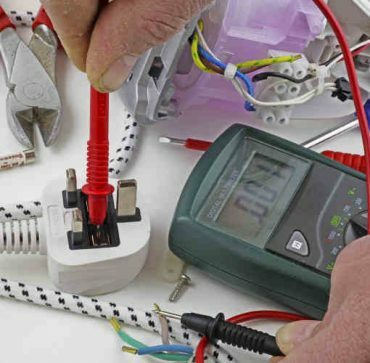 We pride ourselves on the efficiency and cost effectiveness of our PAT testing service but to see a selection of other electrical work completed by ourselves, please click on the following link. To find out more information about the electrician service we offer to landlords in Southend, please call us directly on 01702 873350.